HERB: Mastering the Art of Cooking With Cannabis is a gourmet cookbook of cannabis-infused recipes featuring beautiful photography and a wide variety of recipes. The book was created by The Stoner’s Cookbook, an online infused recipe resource for medical cannabis patients, and was written by master chefs Laurie Wolf and Melissa Parks. The book also features mouth-watering food photography by Bruce Wolf. We loved our copy of HERB immediately due to the impression of quality and professionalism it gives. We knew right away that this book wasn’t going to rely on hackneyed stoner tropes. This is as much a coffee table book as it is a cookbook: it is well bound with sturdy material, and the cover, from the beautiful photo to the textured print and stylish typography, makes it clear that HERB is intended as a resource for those who are interested in cooking seriously with their herb. Best of all, HERB addresses some of the most common complaints people have about infused foods in general: dosage and flavor. Admittedly, I am usually not a huge fan of edibles for these reasons. Either I get way too high because I don’t know how potent the edible is, or I can taste the awkward flavor of cannabis distinctly because it dominates the recipe that wasn’t intended to have it included as a flavor. HERB opens with a chapter about the various types of oils that can be infused, how to gauge the potency of your oils, and how to choose a strain of cannabis that will create the flavor and effect you are seeking. Each recipe within the book seems to be crafted with this in mind, with specific instructions regarding the type of oil or butter to use. 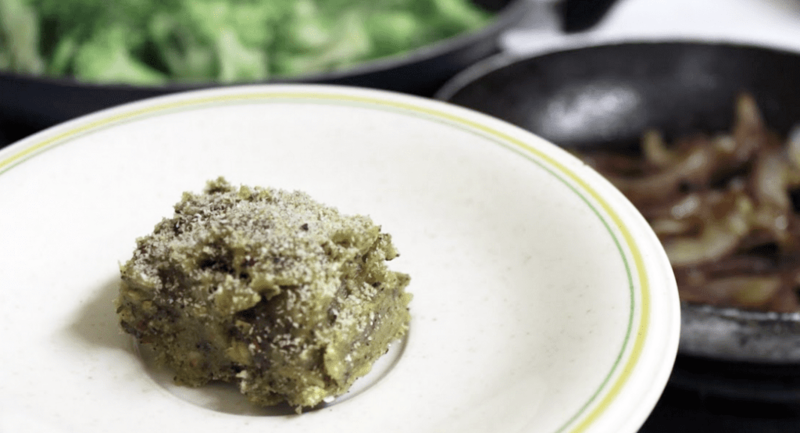 When we tested out a recipe for steak from HERB on Christmas Eve, part of the Ganjapreneur team collaborated to make a compound cannabutter, which is something none of us had ever heard of before. By rolling our infused butter up with a bunch of spices and herbs, we were able to treat it like a delicious garnish that was applied as the final step to our meal. Apologies to the vegans, but the pictures really don’t do it justice: dripping with our flavorful, mildly-dosed compound butter, the meat was gone within a few minutes of being served. Overall, we love the book and how it works to advance cannabis normalization by reiterating the truth that cannabis is, truthfully, just an herb. Check out our short video below for a closer look! To learn more about HERB or purchase a copy, visit HerbKitchen.com.